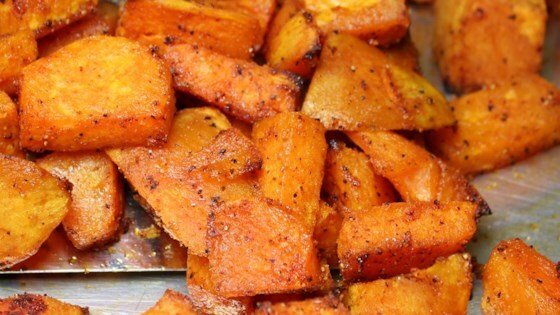 Place the sweet potato chunks into a large mixing bowl. Drizzle with the olive oil, then sprinkle the brown sugar, paprika, black pepper, onion powder, garlic powder, poultry seasoning, chili powder, and cayenne pepper overtop. Toss until the potatoes are evenly coated with the seasoning. Spread onto a baking sheet. Bake in the preheated oven for 15 minutes, then turn the potatoes over with a spatula, and continue baking until the sweet potatoes are golden and tender, 10 to 15 minutes more. I prepared this recipe as written. It was good, but not extraordinary. This was wonderful! I didn't have poultry seasoning or the chilli powder, but I added 1 tsp of cinnamon. It was perfect! A definite do again!